See our map and directions to our office! Kevin M. Bogdon, DDS has provided high quality, comprehensive dental care in a warm, friendly environment in the Glendale, CA area for over 20 years. A dentist with deep ties to the Glendale community, Dr. Bogdon is dedicated to creating an atmosphere where you and your family will feel at home. Through his practice, Dr. Bogdon provides general family dentistry (crowns, dentures, veneers, and fillings), exams and cleanings, cosmetic dentistry, dental implants, periodontal care, sleep apnea treatment, Opalescence® whitening, and Invisalign® clear aligners. Our professional, congenial team works hard to ensure your comfort while providing you with the best service possible. You should also expect an efficient dental experience. We try our best to stay on time because we understand that your time is just as valuable as ours. 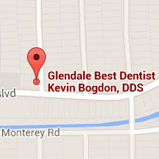 We invite you to contact our Glendale dental office to schedule an appointment with Dr. Bogdon and our team. Your new, healthy smile starts here! Come in for a complimentary evaluation. Find out if Invisalign is right for you!